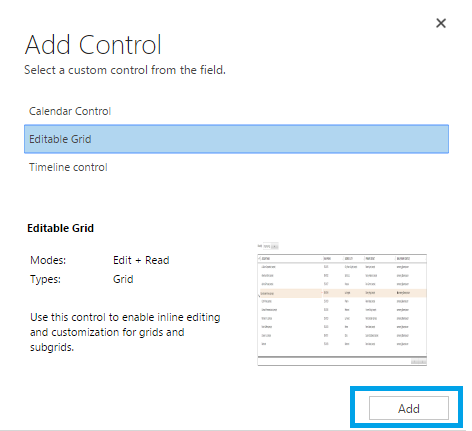 One of the most amazing and awaiting feature in Dynamics 365 is editable grids. In most of our implementations, we’re asked by customers to create an editable grid to allow users to quickly modify specific record’s data without changing the form. However, Microsoft has released the ability to turn any grid in Dynamics CRM into an editable grid with their latest release of Dynamics 365. Editable grids functionality is available for sub grids (that appear on forms) and home grids (the grid that shows when you select an entity from the Site Map, or when you expand a sub grid on a form to be full sized). How to enable editable grid for an Entity ? To enable the editable grid for a home grid, Go to customization’s for the entity at Settings –> Customization’s –> Customize the System –> Entities select any entity (In my example below, I’m working on the Account entity. ), and then click on the “Controls tab” for an entity you want to configure. Click on “Add Control link”, you can select the Editable Grid control in the dialog that pops up, and click on Add as shown below. You’ll then have the option to enable the editable grid for the Web, Phone and Tablet by selecting the appropriate radio buttons. 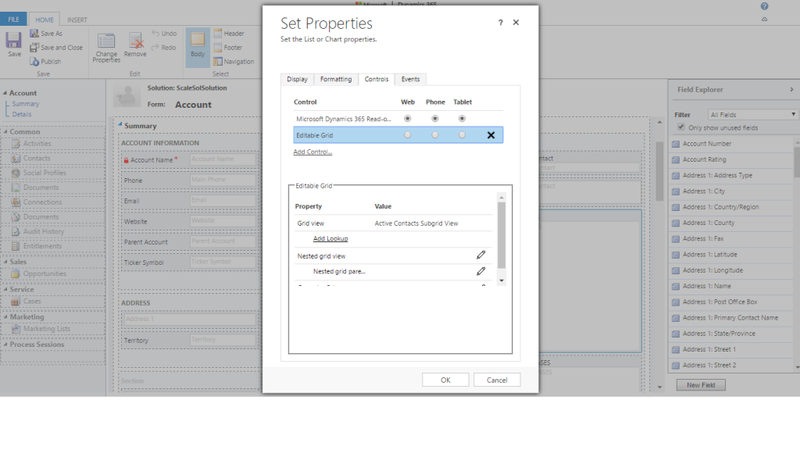 Now as we have enabled editable grid control for account entity we can navigate to “sales –> Accounts” and selsct Show As button to “Editable Grid” as shown below. Now click (single click) on any records and select any column and you can experience editable behavior as shown below. For a Sub Grid, navigate to the form that the sub grid is on and find the sub grid you want to make editable. Select the sub grid on the form, and click on the Change Properties. In the dialog that appears, select the controls tab, and click on the Add Control link. As with the main grid, you can add the Editable Grid control, and then configure in the sub grid properties dialog which form factor the editable grid applies to (web, phone, and tablet). What’s supported on the editable grids? For home page grids and global quick create forms, a browser refresh is needed for the business rules changes to take effect. This is quick and easy to implement. keep visiting our blog for the latest updates regarding Dynamics 365.